Christmas Hampers With Free Xmas Delivery Australia-Wide! Welcome to Australia's experts at quality and perfect presentation every time. The Hamper Emporium is proudly Australia’s leading supplier of Australian Christmas hampers and gifts, a title we've earned through passion and commitment to delivering the finest selection of products over the last decade. If you have been looking for Australia’s most beautiful Xmas hampers, you've just discovered the perfect solution with The Hamper Emporium. If you're looking for unique and luxurious gift options for someone special this Christmas, then we're guaranteed to have the Christmas hamper of their dreams in stock and ready to deliver from our Sydney warehouse. We've developed partnerships with the world's most delicious brands so that our Christmas gift hampers stand out for their quality and elegance and are guaranteed to impress even the fussiest Christmas recipient. Gift hampers are the perfect Christmas gift idea for the office, colleagues, and just as spectacular for friends and family, because everyone knows that Christmas food should always be the best of the best, which is why having a hamper delivered to the door for Christmas makes so much sense... Help them impress all their visitors with a gourmet feast, they'll thank you over and over. How Can You Choose the Best Christmas Gift Hamper? When choosing a Christmas gift hamper for your recipient, it can be easy to feel overwhelmed. Of course, our role here at The Hamper Emporium is to ensure that Christmas gift shopping overwhelm is a thing of the past for our customers. 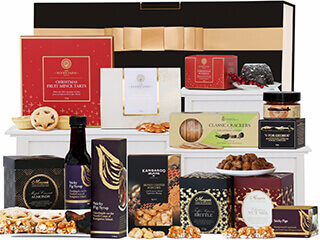 The best thing about choosing one of our luxury Christmas hampers is that every item included has been tested over and over again by our expert team so that you know your gift is packed full of only the finest quality and flavours. Because we've done the hard work for you, and created Xmas gifts that are guaranteed to impress, while we know, no matter what hamper you choose to have delivered across Australia, that your recipient may have some favourite goodies they'd simply adore to be included. If you're looking for a gift for wine lovers, then we've created a range of Australia's best wine hamper. We've got options for red wine and white wine, or if you're not sure which they prefer, we've got gift boxes that include both! Savoury delights abound in a massive range of our hampers, but we've got the sweetest of sweet gifts too, if you're having trouble choosing or not quite sure what your gift recipient will prefer, then choose a Christmas gift option that is packed full of both sweet and savoury, and you'll be guaranteed to impress. The best thing about gifting a hamper for Christmas is that our luxury gift baskets offer such a variety that no matter what their favourites are, there's sure to be something special that will absolutely delight them inside, and they can share the rest with family and friends. Having a huge range of gifts packed inside one luxury gift makes it a little easier to find the perfect gift for them without any risk of disappointment. How Soon Do I Have to Order My Christmas Hamper? Even though we have extended our delivery time up to Christmas Eve this year, it's important that when ordering that you take our estimated delivery times into consideration. All our gift hampers with free delivery can be upgraded to express and even same day delivery options, but we can't stress enough that Christmas postage delays can happen, and do happen. As we know you'll appreciate, with Aussies busy trying to get gifts to loved ones for the festive season, our delivery services are often overwhelmed with such huge volumes as it gets closer to Christmas, that we like to ensure our customers order with plenty of time in case of delays. Depending on your location, the postal volume that our delivery services are trying to get out to Australian's everywhere, delivery of Xmas hampers can take less or more time. We recommend that our customers always check the estimated delivery times on the product description pages or the checkout window, however, please note that estimated delivery times are not always accurate. When the postal service or courier functions as normal, the delivery time should be accurate, however, the holiday season can be accompanied by some delays in terms of transport and delivery. Thus, it is always best to add an extra couple of days to your delivery time just to make sure. Can I Create a Personalised Christmas Hamper? For our business hamper options, we offer a huge range of corporate branding. Corporate branding can include branded ribbons, branded luxury gift boxes, personalised gift cards, and even custom engraved accessories to create a truly personalised corporate gift idea. To learn more about the corporate branding available for businesses, please refer to the corporate hampers section on the homepage. Our branded corporate hampers are available for Christmas and year-round. Will My Christmas Hamper Include A Free Gift Card? Each of the hampers at the Hamper Emporium is accompanied by a premium gold card; this card is included in the price of your gift basket and can be personalised with a message of your choosing. All gift boxes include a free personalised gift card, and customising it is simple. During the checkout process, simply enter your message into the allocated field and your personalised wording will be printed on the card and included with your gift hamper. We also offer a selection of premium gift card upgrades, so that whether it's Christmas or another special occasion, you'll find the perfect gift card to match. All our premium quality Xmas hampers are delivered in luxury gift boxes. Our custom designed hamper boxes are perfect for storing keepsakes and are the perfect gift for your loved on this Xmas. Does The Hamper Emporium Deliver Corporate Branded Hampers? The Hamper Emporium is the number one provider for Australian corporate hampers! Not only do we provide a stunning range of corporate gift baskets, we also provide businesses with corporate branding options; this includes customised ribbons and gift tags along with custom engraved gifts, personalised wine and more. While we offer year-round gift hampers for businesses to impress and show gratitude to staff and clients, The Hamper Emporium understands that Christmas is one of the most important occasions for business gifting. We offer a huge range of Christmas hamper ideas specially designed and backed by decades of gifting experience to bring true joy for the festive season. In addition to providing you with the best selection of Christmas hamper ideas for corporations, employees, or important business relations, our custom corporate branding is also available for Christmas or year-round gifting. For more information about corporate branding our Christmas gift hampers or to get some Christmas hamper ideas for corporations, be sure to check out the corporate hamper section on the website. Why Choose Gourmet Hampers For Festive Gifting? Over the past decade, we quickly realised that to become Australia's best, we had to listen closely to our customers. We knew to make your life easier, we had to provide the perfect presents that not only made your recipient feel amazing when it arrived, but also made our customers feel wonderful when they ordered. We knew our customers needed to know they were sending Australia's best products to the people they cared about, and so, above all else, we set about to fill our gift boxes with a range of the most impressive, most delicious gourmet fare that would impress even the fussiest of foodies. We sourced, and continued to source a range of absolutely delightful sweets and exquisite savouries, many of which are exclusive to The Hamper Emporium. Choosing the perfect gift whether it's for Christmas or other special occasions can feel impossible. We all know that by sending a single gift, it's easy to choose something that isn't really aligned to your recipient's likes and dislikes. The most amazing thing about gourmet hampers is that everyone loves food, and even better - everyone loves delicious gourmet food! By gifting a hamper, you're not sending a single product and risking an unwanted gift; you're sending a wonderland of deliciousness, a perfectly presented luxury gift box of beauty and flavour that's sure to have something inside that they adore. Each year, we extend our range of Christmas hampers, and for 2019 it's our best year yet, with the finest gourmet products. 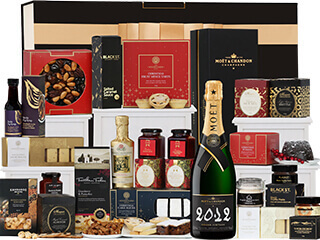 With brands such as Baylies Epicurean Delights, Morgan’s, Kangaroo Island Produce, and Moet & Chandon included in our gift baskets, you are bound to find the 2019 Christmas gifts that gourmet lovers are going to be impressed with. What Chocolate Hampers Are Best for Christmas? Our 2019 Christmas gift hampers contain the finest chocolate brands; this includes brands such as Butlers Irish Chocolates, Ernest Hillier, and Willie’s Cacao. By providing customers with such a mix of gift baskets and chocolate brands in our 2019 Xmas gift baskets, you can provide your recipients with a chocolate tasting experience they will remember for a long time. Many of our 2019 Xmas gift baskets hampers that contain chocolates also contain a nice bottle of bubbly. There are Christmas gift hamper with sparkling wine, white wine, red wine, and even fine French champagne. Plenty of hamper options to start celebrating the most wonderful time of the year. What Are the Newest Xmas Hampers? To ensure everyone can find the perfect hamper for their recipient, we have updated some of our classics with delightful new products; this includes shortbread from the Woods Farm and a nice wine from the Islander Estate. Of course, there are also some new hampers to delight in this holiday season. 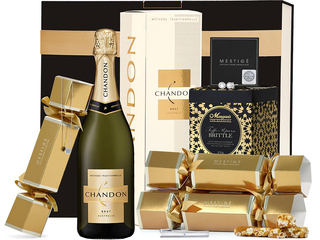 One of the new additions this holiday season is the Chandon Hamper with Crystals from Swarovski®. Still, there are many other Christmas gift hamper options to discover, so be sure to check the Christmas range for other new additions such as the Celebration of Christmas Hamper, Barossa Shiraz & Christmas Cake Hamper, and many more! What Treats Are Included in the 2019 Christmas Hampers? Our latest range of Christmas hampers contains so many delicious treats, it is difficult to name them all here. Of course, we can drop some brand names, so you have a better idea of what you can expect. 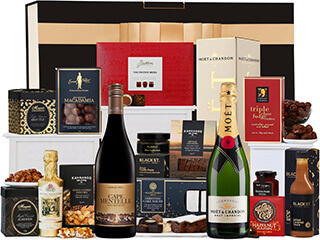 When you check our collection of 2019 gift baskets this holiday season, you will find brands such as Swarovski®, Moet & Chandon, Baylies Epicurean Delights, Butlers Irish Chocolates, Islander Estate, Robert Oatley, Willie’s Cacao, and many others! What Are the Best Christmas Gift Hampers for Wine Lovers? The Hamper Emporium has created numerous Christmas gift baskets containing outstanding wines. We have selected impeccable vintages from wineries such as Robert Oatley, Cape Mentelle, Brown Brothers, Chandon, and others. We also provide a collection of exquisite champagnes, featuring labels such as Moet & Chandon, Veuve Clicquot, Dom Perignon, Bollinger, and Piper-Heidsieck in our hampers. Are There Any Budget Christmas Hamper Options? We understand that the holiday season can be expensive for many of our customers, so we have a collection of budget Christmas hampers. Of course, budget does not mean that the quality or quantity of the Christmas gift hampers is any less. At the Hamper Emporium, you can buy luxurious brands for the best price. That is our promise to you this Christmas. All our gift baskets and hampers are delivered in a gift box full of quality products to your doorstep. Where Can I Get Christmas Hampers Delivered in Australia? Are you planning on sending your Christmas gift baskets directly to your recipients? Looking for gifts from overseas for residents in Australia? Or do you simply want the hampers delivered to your doorstep? Whichever one it is, the Hamper Emporium is more than willing to help. The Hamper Emporium provides customers with Australia-wide free delivery; this means you can purchase any of the hampers at the Hamper Emporium and get it delivered free of charge. Simply select the standard delivery option during the checkout process and your Christmas gift hamper will be on its way. Please note that the Hamper Emporium provides additional delivery options for customers who want to speed up the delivery of their gift basket. Available delivery options will be visible during the checkout process. Alternatively, you can read up on the delivery options of your Christmas gifts baskets and the product description page. What Are Good Christmas Gifts for Someone Who Has Everything? Our Australian Xmas hampers are the perfect Christmas gifts for someone who has it all. All Australian Christmas gift baskets at The Hamper Emporium are filled with countless gourmet products, providing variety and experience for those who have it all. The Australian Christmas gift baskets at The Hamper Emporium are impressive, even for people who have everything! Not only the variety of products inside our Australian Xmas gift hampers impress, the presentation of our Australian Xmas gift baskets impresses just as much. To ensure customers get the best-looking Australian gift hampers, we present our Australian Christmas gift hampers in a keepsake box; this can be one of our standard gift boxes or a handcrafted wooden box depending on the weight of the products inside. So, with the gift hampers of The Hamper Emporium, you do not have to worry about a thing! Where Can I Find the Best Gift Hamper Delivery Service? The Hamper Emporium provides the best delivery service for its gift hampers since we provide free delivery on Australian hampers. Customers can take advantage of free delivery on Australian hampers by selecting “Standard Delivery” during the checkout process. With standard delivery, you automatically get free delivery on Australian hampers. However, our free delivery on Australian hampers is not the only delivery option you can take advantage of at The Hamper Emporium. In addition to free delivery on Australian hampers, customers can speed up the delivery of their gift hampers by choosing “Express Delivery”. While this delivery option is available for a small additional fee, it is a wonderful option for anyone who has ordered gift hampers a little later than usual. Customers purchasing one of our Sydney gourmet hampers this holiday season can also depend on delivery up to Christmas Eve. By delivering our Sydney gourmet hampers a little longer this holiday season, even customers who are ordering the Sydney gourmet hampers a little later can count on full access to our Sydney gourmet hampers catalogue. So, be sure to take full advantage of our Sydney gourmet hampers and accompanying delivery service this Christmas season. What Are Good Christmas Gifts for People in Australia? Australians will love the 2019 Australian Xmas gift baskets at The Hamper Emporium. For our new collection of 2019 Australian gift baskets, we have selected some of the finest Australian brands; this includes brands such as Baileys Epicurean Delights, Morgan’s, Partridges Artisan Bakehouse, and Gourmet Regional. By choosing Australian brands for our 2019 Australian Xmas hampers, we can provide our customers with the best Aussie flavours this holiday season. Even though we also include some international products in our 2019 Australian Xmas hampers, these products are chosen to supplement the delicious Aussie products inside. So, in addition to Australian gourmet treats, our 2019 Australian hampers also include some classic French champagnes! Gourmet products are not the only products to be found in the Melbourne Christmas hampers at The Hamper Emporium, there are also a bunch of accessories and personalised gifts. This year, we even added Crystals from Swarovski® to the Melbourne gift basket catalogue. So, if you are looking for something to impress, one of our Melbourne Xmas hampers with Crystals from Swarovski® is bound to do it. In addition to Crystals from Swarovski®, our Melbourne Xmas gift baskets also include some customised leather accessories. From toiletry bags to keyrings, customers can add the initials of their recipient to these items from our Melbourne Xmas hampers collection, making the hamper even more special. Which Are the Best Corporate Gifts to Provide a Client? Businesses can also count on The Hamper Emporium for corporately branded hampers. Our corporate branded hampers are the perfect way to advertise your business. The corporate branded hampers at The Hamper Emporium provide your business relations with an exquisite selection of gourmet treats. These gourmet treats can be supplemented with champagne, exquisite wine, or another beverage selected to impress. Businesses can find many corporate branding options for corporate branded hampers. There are customised ribbons and gift tags, so plenty of options for anyone who wants to make our corporate branded hampers stand out from other Christmas gifts this holiday season. How to Put Together Christmas Gift Hampers? What to Include in a Christmas Food Hamper? Christmas gift hampers can include lots of different foods and beverages, so the content of your Christmas gift hampers is usually subject to your recipient’s personal preferences and favourites. As mentioned earlier, our Perth Christmas hampers are built around a certain theme. The same applies to all the Christmas food hampers in our collection, which means the best way to create your Perth Xmas hampers is to find a product to build your hamper around. 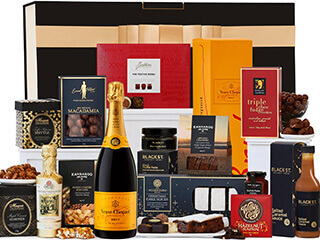 There are many products in our Perth Xmas gift baskets which are signature products; for example, our Chocolate & Veuve Hamper contains a bottle of Veuve Clicquot Yellow Label NV champagne as the main product. Then, this product is supplemented by countless gourmet treats, creating another addition to our Perth gift basket catalogue. To ensure our Xmas foods wine hampers are fresh when they arrive at our customer’s doorstep, we choose the finest gourmet products with a long shelf-life. Delicious crackers, biscuits, and even vintage wines are an integral part of the Christmas food hampers at The Hamper Emporium. If you purchase one of our Christmas food hampers, you can be sure the products inside will be fresh. Be sure to check out our range of Xmas food hampers today and benefit from the amazing gourmet selection inside. Where to Buy a Christmas Hamper Basket? When you are looking for the ultimate Christmas hamper basket, The Hamper Emporium is the place to be. Being the leading supplier of Christmas hamper baskets in Australia, you can undoubtedly find a Christmas hamper basket that meets your requirements as well as your budget. Our range of Christmas hampers baskets contains classic Christmas hampers, which have been a big hit with our customers for many years. Of course, there are also some new Christmas gift hampers, which have been created by our team to surprise our loyal customers, who return to The Hamper Emporium every year to find their Christmas presents. So, what are you waiting for? Check out the range of exquisite Xmas hampers today and benefit from our sharp prices and free delivery Australia-wide!